Your child's first pair of glasses will make an important difference in his or her ability to see and interact with the surrounding world. However, a new pair of glasses can also present a big adjustment for both parents and kids as you get used to a new look and a new responsibility. For many families this can be a cause of conflict as children may refuse to wear their new specs or be forgetful or careless by losing or breaking them. Parents should also be sensitive to the fact that it could affect a child’s self esteem and unfortunately deal with teasing by peers. Here are some ideas to pull you through the initial days of your child's first frames and some tips on how you can help them ease into their new look. Display an encouraging and positive attitude about your child’s new look. Don’t just talk about how important glasses are for your child, but play up the fact that they now have a new, fun accessory or magic tool to help them have a better “power” of vision (whatever you think will speak to your child). On the other hand if your child picks up that you are disappointed about the new look, it will rub off and they might not be as willing to persevere. Ensure that your child is rested and in a good mood the first time he or she puts the glasses on. Let your child wear his or her glasses for short periods while doing an enjoyable activity where wearing glasses will make the biggest difference, for example while watching a favorite television show, or reading a favorite book. 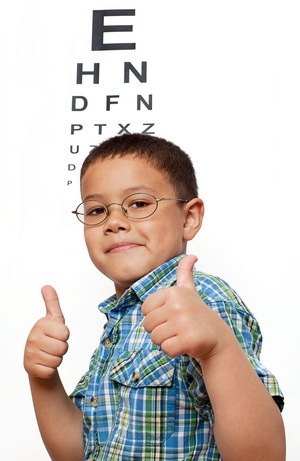 The aim here is that your child will be having fun and recognizing the benefits of the new glasses at the same time. Before you leave the eye doctor’s office, have the optician check that the glasses fit right and have a comfortable style. This means that they don’t slip, pinch or put pressure on your child's face, are not too loose or too tight. Glasses that don't fit right won't feel right and children won’t want to wear them if they aren’t comfortable. Don’t turn wearing glasses into a battle or constantly nag your child to wear the frames. Help your child understand that being able to see is a gift. Encourage and praise your child when they do wear their new frames, especially until wearing glasses becomes second nature. Make glasses part of the daily routine. Make it the first thing your child does in the morning and the last thing to do before going to bed. Remember, it can take time to adjust to wearing glasses, not to mention seeing with a new prescription. Be patient and remember to focus on the gift of eyesight and the enhanced quality of life your child will have in the long run.